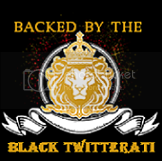 Black Twitterati: April 2009Black Twitterati- Celebrating the Black Twitterati... one tweet at a time. Who's worth following, who isn't. 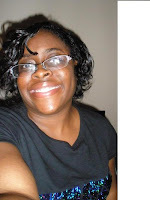 Her syndicated FuseBox Radio Broadcast was founded back in 1998 while she was an undergrad at Rutgers University. Her show is a mix of new and classic hip hop, along with soul music from around the globe. But before you assume that FuseBoxRadio is only about the music, check her Twitter stream, blog and podcast for a barrage of political topics and social commentary. Who was all over the Swine Flu outbreak, the ongoing Somali pirate developments and AFRICOM? It was FuseBoxRadio. This is a great example of expanding your reach by using social media for reasons other than direct self-promotion. Thousands of shows that started out on AM/FM radio are being broadcast on the internet right now. But not many are able to branch out beyond their original audience. FuseBoxRadio manages to stand out by using social media properly and by being multifaceted at a time when it's so much easier to dumb it down. Catch her transmissions wherever you can. "Being smart for a lot of kids is a cultural issue right now. We say, if you're a geek that's great, cause guess what? The owner of Microsoft was a geek and look where he is. I was a geek and look where I am." Maybe you've heard of today's Twitter superstar. If you have, then you already know Dr. Bernard Harris is a physician and former NASA astronaut. Maybe you recall that he became the first African-American to perform a spacewalk back in 1995. But his current, down-to-earth pursuits using social media are the ones that have landing this rocket-man on Black Twitterati today. Dr. Harris' non-profit organization, The Harris Foundation, invests in educational initiatives for disadvantaged children and runs the ExxonMobil Bernard Harris Summer Science Camp, a free program designed to help middle school students build strong skills in science and mathematics. At the same time, Dr. Harris uses social media to reach out to students and educators, with regular entries on Facebook, Twitter and YouTube. This Spring, he's traveling the country and blogging on his Dream Tour to motivate students to study science, technology, engineering, and mathematics. Oprah Comes To Twitterville: There Goes the Neighborhood? First take a look at the picture on the left. Do you know what that is? 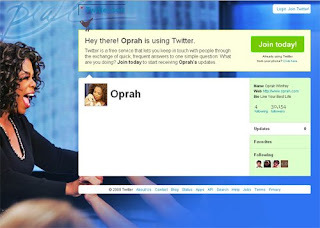 It's a screenshot Oprah Winfrey's Twitter page. As you can see, the queen of daytime talk has tens of thousands of followers without uttering one tweet. But tomorrow, Oprah plans to dole out her first ever twit on her television show with Ashton Kutcher by her side- at which time all hell will break loose. Well, it will, won't it? Haven't all of the Twitter hiccups in the last week burned the Fail Whale into our weary retinas? What will happen when all those soccer moms, retirees, and other demographics hop online to discover the deliciousness that is Twitter? Can a system that is already creaking and groaning possibly take the strain? Just maybe it can bend a little more without breaking. It'll have to. Ready or not, here comes the most powerful woman in television. ErinScandalous is a great example of a Twitterer who is combining social media and new media. 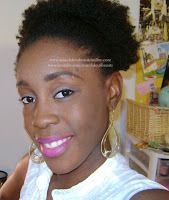 She's a multi-blog blogger with a focus on beauty, haircare, and skincare for black women. In addition to having popular blogs full of trends and product reviews, she also has an active Youtube channel and a Facebook fan page. Mind you, she's keeping all of this together (and updated!) while she works toward a B.S. in Accounting. Juicy tidbit: Apparently, Erin is stirring up controversy already this week with a video about the kinds of "Men We Attract As Women with Natural Hair." Whether we agree with her sentiments or not- good for her! When it comes to making the most of social media, we've found nothing as potent as controversy. Always on the lookout for something new and fresh, we are back from a trip to the world of BlackTokyo. 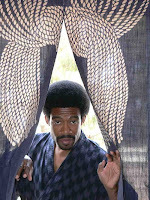 Here is a twitterer who is quickly drumming up an international following by giving the latest tidbits on black life and culture in the de-facto capital of Japan. He also gives an inside view of Japanese culture and politics, along with controversial topics (definitely check out the post "Girl, I'm Proud of You" for an eye-opening look at the challenges faced by black women in Japan) and dispatches on the internet. Trust us when we say this is a blogger who has intimate knowledge of his subject matter. As a Marine Corp veteran, he has been traveling between the U.S. and Japan for the last two decades. 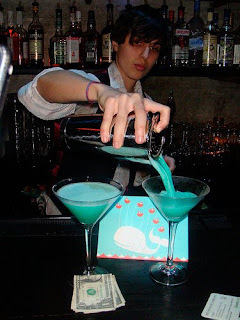 The Fail Whale drink, named for the illustration that pops up on your computer screen when Twitter is over-taxed, first appeared at the Shorty Awards in New York. Everyone says this is going to be the cocktail of the season, but it's almost impossible to find a proper recipe. It turns out there are two or three recipes. Thanks to some industrious Twitter buddies (and little help from @mixologist ) we've been able to piece them together. Choose your own adventure, Twitterati. Pour over ice and mix in a shaker. Serve in martini glasses. Pour ingredients over ice and mix in a shaker. Strain into tall glasses. Garnish with a plastic blue whale and a cherry. Serve. Drop the shot of Vodka and Blue Curacao into the pint glass heineken, garnish with a Sardine. Pour all the ingredients over ice. Shake and garnish with a lemon squeeze. If you decide to try any of these out, please come back and give us a review! Also check out www.whatisfailwhale.info, which is the entire collection of fail whale sightings on the internet. Thanks to the original fail whale creator @yiyinglu for letting us dip our toes in her stream over at Flickr. This is the question that's being knocked around quite a bit these days. That's because last week the Wall Street Journal reported that Twitter has plans to sell "premium" features. There are no real details, except that those special options (which could be anything from analytics to a higher quality of service) would reportedly be sold mostly to businesses. For the record, Twitter founders say there are no fees planned for individuals using the regular service. But, the question lingers: Would you be willing to pay to gain high-powered information about Twitter users and traffic? If so, how much would something like that be worth to you per month?